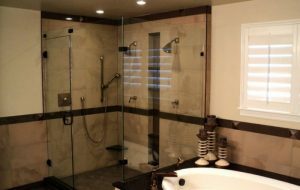 Complete Line Glass offers an incredibly flexible line of custom fabricated shower doors in 1/4”, 3/8”, or 1/2” tempered safety glass. Complete Line Glass fabricates to your specifications, including doors and panels of any size, out of square pieces and pony walls. Choose from a variety of notch and hinge cut outs as well as holes of any size. Complete Line Glass offers a flat polish on every shower door as well as a miter up to 45 degrees when required. 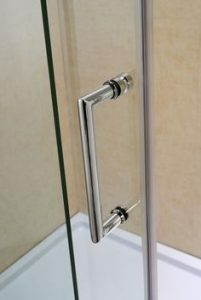 Complete Line Glass stocks all the necessary shower door hardware to go along with your glass purchase, including a vast array of notches, hinges and towels bars. Luxclear Protect is a coated glass product developed to protect the surface of the glass by preventing corrosion due to contaminants related to water, heat and high humidity. Over time, glass can essentially “age” due to surface corrosion caused by this exposure. The result is glass that appears dull and dirty and the longer the exposure exists—the dirtier the appearance. Unlike aftermarket products, the Luxclear Protect coating fuses with the glass and permanently seals the glass surface so it will remain clear and new looking for the life of the product.